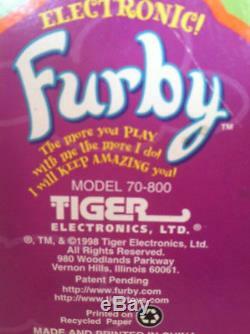 Here it is - the Rare Print Error Box Furby model 70-800 first edition from Tiger Electronics. 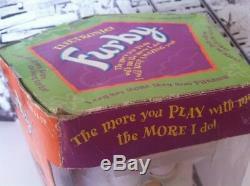 What makes this one different from all the other Furbys is the BOX. The 5 sided top is printed on only 4 sides. 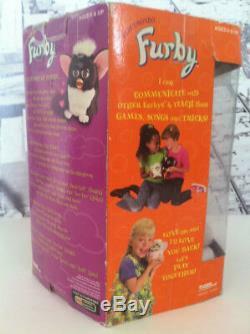 All other Furby boxes are printed on all 5 sides of the top. 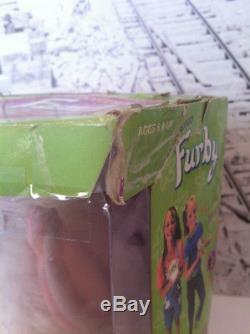 Either a printing defect or initial roll out this Furby lives in a box all it's own. 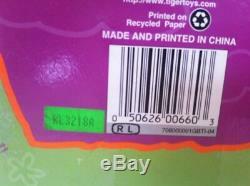 KL3218A RL 708000001GBTI-04 Registry # PA-282 As for the toy itself. The tuft, hair on top, is white. This is the original 1998 model 70-800. These are the first editions. 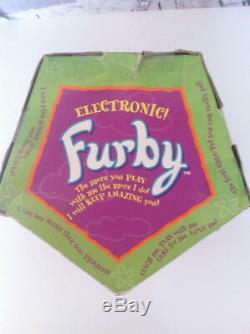 I have not taken the Furby out of the box but cannot account for the previous owner. The box condition is NOT mint. There are signs of age. You may find some dents in the front plastic or in the cardboard part of the box. There may be some bends or separation of the cardboard from the hard plastic front. 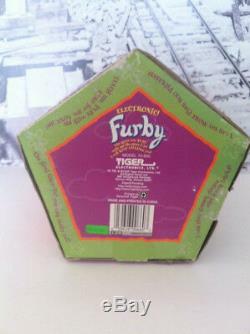 However, the box is still in complete condition, just NOT mint. Please contact me if you prefer expedited or next day service. "With every old find there is a new beginning" - it is with this motto that Old Attic Treasures grounds its core values. The ideals that propel our efforts forward, to seek out, locate and uncover forgotten articles new or used and returning them to their former glory by restoring their purpose or giving them a new one. Nor man or women reading this would want to grow old and useless. Animate objects are all but an extension of the human hand. The human will and the human desire to remain with purpose. Each and every one of the listed items was at one time part of that extended human purpose. And with every old find we can offer a new beginning. 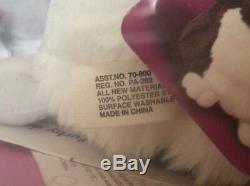 Packaging may be retail or generic and is included FREE OF CHARGE and may show signs of wear and / or damage. Condition of the retail or generic packaging does not effect the condition of the item and is not part of the listed Condition of the advertised item. This will not effect "Item Not Received Claims" 8. Any damage is photographed, disclosed and described. Stock photography and authentic photo's combined are at the sellers discretion. Stock photography will be used for new items that are sealed in original manufacture packaging. Packaging will be photographed and is at sellers discretion. Stock photography and / or packaging may differ slightly from the item you will receive. New items will indicate NEW. Used Items will indicate used, pre-owned, refurbished, reconditioned, for parts, untested, tested to power on or not new. Item will NOT be released unless this is provided. All electronic items that are not sealed in a package have been checked to POWER ON ONLY. Unless stated no other tests are p erformed. It is the buyers responsibility to ensure that item or items will suitable and appropriate for their application and use. Items will be clearly described. Criminal and Civil charges may be pursued. 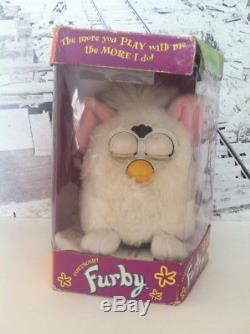 The item "RARE PRINT ERROR BOX and Eyes Closed Furby The Only One of It's Kind On Ebay" is in sale since Wednesday, January 31, 2018. 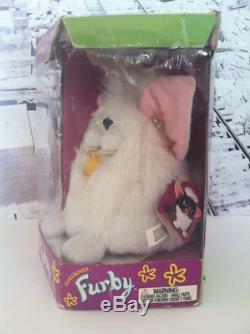 This item is in the category "Collectibles\Animals\Other Animal Collectibles". The seller is "oldattictreasures" and is located in Brooklyn, New York. This item can be shipped to United States, Canada, United Kingdom, Denmark, Romania, Slovakia, Bulgaria, Czech republic, Finland, Hungary, Latvia, Lithuania, Malta, Estonia, Australia, Greece, Portugal, Cyprus, Slovenia, Japan, Sweden, South Korea, Indonesia, South africa, Belgium, France, Hong Kong, Ireland, Netherlands, Poland, Spain, Italy, Germany, Austria, Bahamas, Mexico, New Zealand, Singapore, Norway, Saudi arabia, United arab emirates, Bahrain, Croatia, Malaysia, Chile, Colombia, Costa rica, Panama, Trinidad and tobago, Guatemala, Honduras, Jamaica, Viet nam.